Before the advent of BSA height restrictions on pioneering projects, the boy-sized, 14′ Double Ladder Signal Tower was built by Scout units, Scout pioneering crews, and Pioneering Merit Badge classes on a regular basis. Because it’s such a fine example of Scout Engineering, it has continued to be a feature in the Pioneering Areas of the national jamborees. At this time, with the proper consideration and review from the Council Risk Enterprise Management Committee, in conjunction with the assurance the construction process will be carried out correctly and in accordance with pioneering safety guidelines, a structure like this that is taller than 6 feet can once again be built and climbed upon during Boy Scout summer camp. The materials and assembly instructions as per the project’s designer, Adolph Peschke, can be found here. 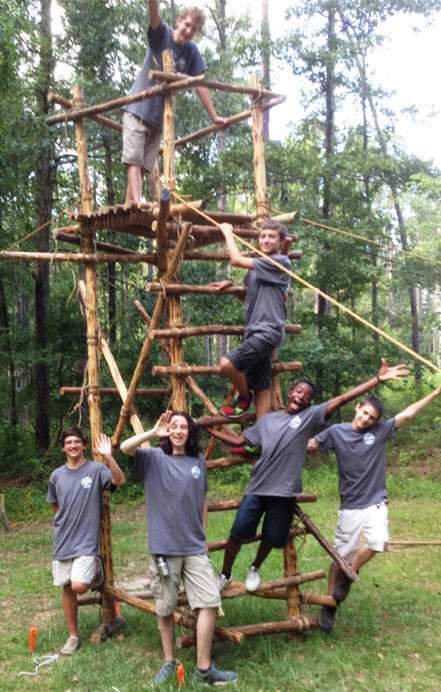 The photos of these Scouts were taken last week during their Pioneering Merit Badge class at summer camp. The floor spars are lashed on, and the tower is hoisted and secured to the pre-built 1-1 Anchors. Pioneering was always a bit scary but nowhere near as dangerous as cycling. I was leading between 1980-2001 and recent visits show strongly that Scouts are less cautious and aware these days. I blame what used to be called common sense being subverted by health and safety requirements.